RCM liquid flow meters have been developed for industrial applications where durability and reliability are important considerations in the monitoring of flow. 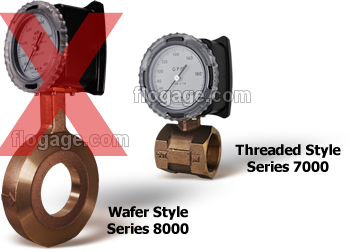 The Flo-Gage has accuracy for most industrial processes and is particularly suited for applications where compactness, low cost, minimal maintenance and resistance to accidental damage are important factors. 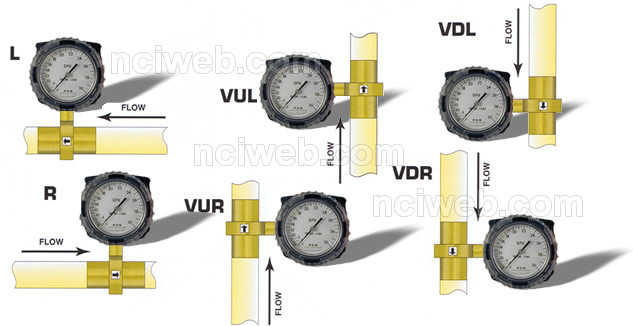 RCM liquid flow meters are suitable for potable and non-potable water, irrigation water, glycol-water mixtures, fuel oils, lubricating oils, gasoline and many other low and medium viscosity liquids (maximum viscosity 500 centipoise). 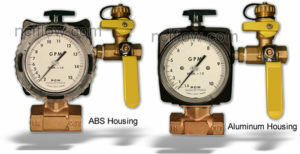 Meters are available in Bronze, Monel or 316SS. Threaded Connections (Series 7000) from 1/4″ to 3″ in NPT or BSP. Wafer Style (Series 8000) from 1/2″ to 8″. Sturdy in-line metal construction to withstand piping stresses without breaking. Black on white dial won’t crack, glaze or become hard to read with age. Expanded 3.5″ (90mm) 270° analog dial for reading at a glance. Suitable for use with both opaque and clear fluids. Measures 6:1 range with 3% F.S. Accuracy. Dial and case factory configured for quick installation – but easily field re-configured if needed. Liquid flow ranges from 4 GPH (15 l/h) in 1/2″ meter to 3000 GPM (1200 l/m) in 8″ meter. 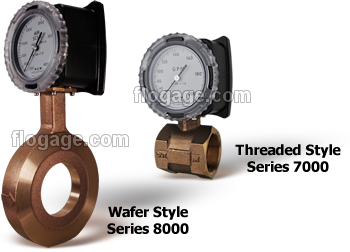 The Flo-Gage can be used to meter flow rates of a wide variety of liquids including water, fuel oils (#2 through #6), lubricants, solvents and many chemical compounds. 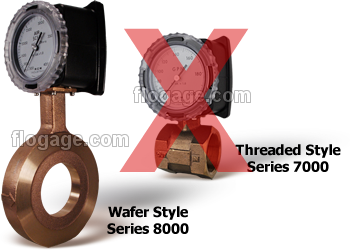 For best accuracy, select a flow rate which will permit normal operation in the upper half of the meter scale. To choose the proper meter, select pipe size and full scale flow rate from the chart of “Standard Flow Rates and Body Sizes“. This is a version of our mechanical meter with an ABS or Aluminum housing that has integrated components to allow for easy flushing and winterization. This meter can be connected to a flow of water or other solution to clean out the inside workings to prevent clogging of sensitive internal components. In addition, this version can easily be purged to prevent damage from freezing liquids in systems that require winterization. Originally designed for the latex modified concrete industry, this versatile meter will provide years of low maintenance operation. 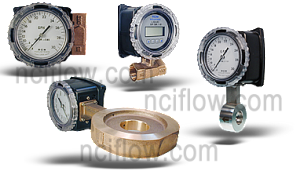 The minimum flow rate which can be read is approximately 15% of the full scale flow rate for all meters. For best accuracy, select a flow rate which will permit normal operation in the upper half of the meter scale. Provide 10 diameters of straight pipe in front of meter. Install control valves or solenoid valves downstream of meter if possible. Resins, paints or monomers which can form solid deposits in the piping system. “Super-solvents” which attack most available elastomers. Sulfuric acid in any concentration. Foams which tend to have inconsistent densities. Toxic substances requiring hermetically sealed enclosures. Fluids with viscosity above 500 centipoise. Pumping systems using piston pumps which produce non-steady flow conditions. Gravity-fed systems having less head than the pressure loss across the meter at normal operating conditions. Series 8000 Wafer unit mount between 150 or 300 class flanges. Accuracy u00b1 3% F.S. u00b1 3% F.S. Repeatability u00b1 1% F.S. u00b1 1% F.S. Do You Know The RCM Model You Require ? ** Submit button will appear as you add information to the form. Do You Require Any Options ?